Weblog Entry - 06/03/2005: "Giant Snare Update"
06/03/2005 Entry: "Giant Snare Update"
I haven't posted much about snare drums lately. I've been remiss. This is a Rhythm King snare, made by yours truly. 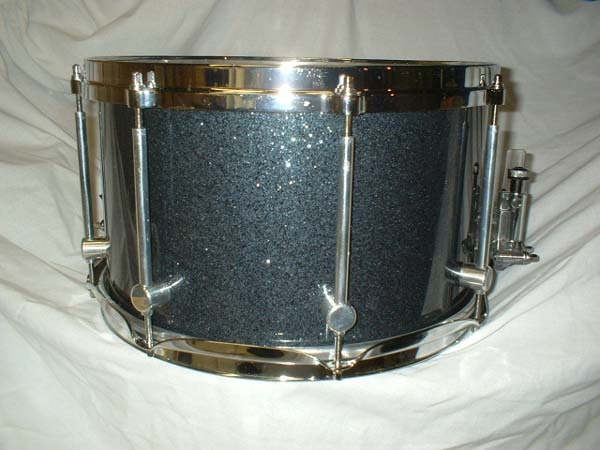 The 8X14" shell is made of fiberglass, and was purchased from Paul Mason of Tempus drums. The color is gun metal blue sparkle, or as one person described it, "Superman's hair color." The lugs are custom made by All Star Lugs. The strainer is a Nickelworks strainer. I drilled all the holes, ordered all the parts, and assembled this drum myself. I consider it the first real snare I've made on my own. Perhaps Rhythm King snares will go into full scale production some day. I just finished it up last night. Then today, I got a great deal on an Oregon Drum.This is a solid piece of wood. Solid. No plies, no seams. It's like a log that's been hollowed out. Regular price: about $800. My price? $265. Then, the Scott from Joyous Lake drums sent me an email. 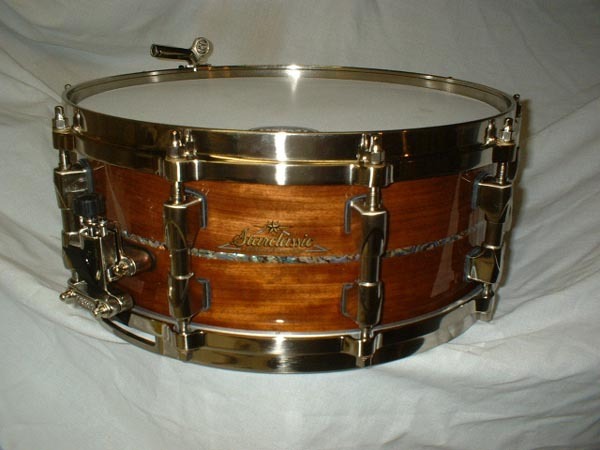 I've had a purpleheart snare on order for almost a year. It was supposed to be shipped late August/early September of last year. Well, the good news is it should be here in a month. Note that the image shows a purpleheart drum with rosewood lugs. Mine will have tulipwood lugs with "dashes of pink ivory"
If you must know, once all this stuff arrives, I'll have a total of 19 snares. Once I hit 20, I think I'll stop for a while. You should make a cd or something. I would love to hear your music. You think you'll stop what for a while? Counting? !